Margaret Brady. (2011). Hmong gardening in Anchorage, Alaska: Cultural continuity and change in a Far North diaspora. MA Thesis, University of Alaska, Anchorage. This graduate study examines the horticultural traditions and practices of Hmong residing in Alaska. The author examined to what extent, how and why her informants grow vegetables as well as herbs used in medicines. Vincent Carveth. (2012). Explorations in the Phonological Reconstruction of Proto-Qiandong-Hmongic Onsets. MA Thesis, University of Calgary. This graduate thesis is focused on the reconstruction of Proto-Qiándong-Hmongic onsets. The author compares fieldwork data from two sources and 24 dialects of the Qiándong subgroup, spoken in China's Guizhou province, with a goal of synthesizing a set of onsets for a common ancestor. Cynthia Larson. (2012). The Relationship of Provider Cultural Competence and Utilization of Prenatal Care in the Hmong of Minnesota. PhD Dissertation, Walden University. This graduate study explores relationships between provider cultural competence, adequacy of prenatal care, and neonatal health outcomes in Hmong American women. Annie Lu Nguyen. (2012). Cultural perspectives, lifecourse, and the social ecology of successful aging: The views of Chinese and Hmong elders. PhD Dissertation, Medical College of Wisconsin. This graduate study examines the ways in which cultural values, social ecology, and lifecourse experiences impact Chinese and Hmong elders' views of successful aging and social engagement. Ma Vang (2012). Displaced Histories: Refugee Critique and the Politics of Hmong American Remembering. PhD Dissertation, University of California, San Diego. The author of this graduate study assesses how Hmong racial subjection has involved a project of displacing Hmong from both nation and history through war and knowledge production. The author argues that the "Hmong refugee" also constitutes an embodied category that activates nuanced responses to US historical amnesia and convoluted treatment. May Vang (2012). Hmong heritage language learners: A phenomenological approach. PhD Dissertation, University of Wisconsin-Milwaukee. This study looks at the experiences of learning Hmong among adult Hmong heritage students. The author's findings reveal that the core components of adult Hmong heritage language learning include an integrated narrative of the collective and individual emigration experience, evaluation of the learner's own language in light of their definition of the Hmong identity, and the learner's own agency in taking positions regarding their language and identity. Christina M. Esposito. (2012). "An acoustic and electroglottographic study of White Hmong tone and phonation." Journal of Phonetics 40: 466-476. This study provides an assessment of tone and phonation in the White Hmong dialect. Christina M. Esposito and Sameer ud Dowla Khan. (2012). "Contrastive breathiness across consonants and vowels; A Comparative Study of Gujarati and White Hmong." Journal of the International Phonetic Association 42(2): 123-143." The authors of this Linguistic study examined accoustic and electroglottographic data from speakers of Gujarati and White Hmong to determine the properties that reliably distinguish breathiness associated with stop consonants from breathiness associated with vowels from within and across two unrelated languages. Chery Smith and Lisa Franzen-Castle. (2012). "Dietary Acculturation and Body Composition Predict American Hmong Children’s Blood Pressure." American Journal of Human Biology 24: 666-674. The authors of this study assess the extent to which dietary acculturation, anthropometric measures (height, weight, circumferences, and skinfolds), body mass index (BMI), and waist hip ratios (WHRs) are associated with blood pressure (BP) measures in Hmong children living in Minnesota. Jean Michaud. (2012): "Hmong infrapolitics: a view from Vietnam." Ethnic and Racial Studies, 35(11): 1853-1873. Drawing upon notions of indigenization of modernity, agency and resistance in the context of an egalitarian society involving the Hmong in northern Vietnam, the author of this article examines whether agency that is directed at diverting modernization is automatically intentional and whether under certain circumstances it becomes resistance. The author posits that the Hmong in Vietnam utilize infrapolitics while also being tactically selective in relation to modernity. Richard H. Molinar. (2012). "Indigenous Asian Specialty Vegetables in the Central Valley of California." HortScience: A Publication of the American Society for Horticultural Science, 47(7): 835-838. This research article discusses 24 Asian vegetables typically grown on farms and sold to specialty crop packing houses in Fresno and at farmer's markets in California. The author also provides information on cultural and culinary uses and pest problems. Louisa Schein and Va- Megn Thoj with Bee Vang and Ly Chong Thong Jalao. (2012). "Beyond Gran Torino’s Guns: Hmong Cultural Warriors Performing Genders." Positions 20(3): 763-792. The authors of this article begin by exploring the cultural and racial politics associated with the film Gran Torino and then move to a broader discusion about how Hmong negotiate the mediated terrain of gendered and racialized politics in the U.S..
Nathan D. Shippee, Jessie Kemmick Pintor, Donna D. McAlpine, and Timothy J. Beebe. (2012). "Need, Availability, and Quality of Interpreter Services among Publicly Insured Latino, Hmong, and Somali Individuals in Minnesota." Journal of Health Care for the Poor and Underserved 23 (2012): 1073–1081. The authors of this study compare enrollee-reported need and availability of interpreters, access to professional and consistent interpreters, and problems with quality of interpreter-assisted communication among Latino, Hmong and Somalis in Minnesota. Compared with Latinos, Hmong and Somali enrollees reported greater needs and more communication problems, Somali enrollees reported lower availability, and Hmong enrollees reported lower access to professional interpreters. Sarah Turner. (2012). "'Forever Hmong': Ethnic Minority Livelihoods and Agrarian Transition in Upland Northern Vietnam." The Professional Geographer 64(4): 540-553. This article examines how Hmong farmers have adapted to, circumnavigated, and worked to resist state sponsored agrarian change and other interventions in the northern Vietnam uplands over the past two decades. Sarah Turner. (2012). "Making a Living the Hmong Way: An Actor-Oriented Livelihoods Approach to Everyday Politics and Resistance in Upland Vietnam." Annals of the Association of American Geographers, 102:2, 403-422. The author of this study utilizes ethnographic data to show how Hmong individuals and households in Northern Vietnam supplement agricultural livelihoods by navigating new economic opportunities, while also resisting unwanted reliance on the market. Ma Vang. (2012). "The Refugee Soldier: A Critique of Recognition and Citizenship in the Hmong Veterans’ Naturalization Act of 1997." Positions 20(3): 685-712. The author of this article critically interrogates the racialization of Hmong in the debate surrounding the U.S. Hmong Veterans' Naturalization Act of 1997. Mai See Yang, Jeffrey A. Burr and Jan E. Mutchler. (2012). The Prevalence of Sensory Deficits, Functional Limitations, and Disability Among Older Southeast Asians in the United States. Journal of Aging and Health 24(7): 1252-1274. This study uses American Community Survey data to describe the prevalence of and risk factors for sensory deficits, cognitive and physical functional limitations, and disability among older Southeast Asian refugees in the United States. To faciliate additional scholarly communication and debate about topics discussed in both new issues of the Hmong Studies Journal, moderated blog forums have been added to the webpages of each newly published journal issue. Diversity in Diaspora: Hmong Americans in the Twenty-First Century, a scholarly anthology to be published by the University of Hawaii Press in February 2013 wrestles with Hmong Americans’ inclusion into and contributions to Asian American studies, as well as to American history and culture and refugee, immigrant, and diasporic trajectories. The volume is likely the most comprehensive anthology of research related to Hmong Americans to be published since the mid-1980s. 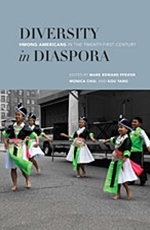 Following a summary of more than three decades’ of Hmong American historical experience and a demographic overview of contemporary Hmong America, chapters investigate the causes of and solutions to socioeconomic immobility in the Hmong American community and political and civic activism, including Hmong American electoral participation and its affects on policymaking. The influence of Hmong culture on young men is examined, followed by profiles of female Hmong leaders who discuss the challenges they face and interviews with aging Hmong Americans. A section on arts and literature looks at the continuing relevance of oral tradition to Hmong Americans’ successful navigation in the diaspora, similarities between rap and kwv txhiaj (unrehearsed, sung poetry), and Kao Kalia Yang’s memoir, The Latehomecomer. The final chapter addresses the lay of the land in Hmong American Studies, constituting a substantive bibliographic review. In October 2012, Hmong Cultural Center's Hmong Resource Center Library was awarded a grant from the Asian Pacific Endowment of the Saint Paul Foundation to upgrade its library catalog system. Txongpao Lee, Executive Director of the Hmong Cultural Center stated: "We are very excited that this new funding support will allow us to upgrade the existing ten year old Alexandria catalog system in our special library focusing on Hmong Studies. It has been our goal to upgrade the catalog system for several years. We are particularly excited that this newly upgraded catalog system from Alexandria will make it possible for us to also put our internal Hmong Resource Library catalog system online linked to our library website for scholars, students and community members to explore our library holdings in a user-friendly format prior to visiting our center. We are very grateful to the Asian Pacific Endowment of the Saint Paul Foundation for this grant that will significantly improve our capacity to serve the community with our comprehensive Hmong Studies research library." The Consortium for Hmong Studies between the University of Minnesota-Twin Cities and the University of Wisconsin-Madison (http://hmongstudies.wisc.edu/index.htm) will be hosting our second conference entitled "Hmong Across Borders" on October 4-5, 2013 at the University of Minnesota-Twin Cities. This will be an interdisciplinary, international conference that will focus on current, innovative research on the Hmong across different intellectual and national boundaries around the world. The aim of the conference is to gather scholars around the globe who are interested in critical Hmong studies and related ideas. This includes bringing together well-established scholars as well as those beginning their careers. Graduate students are encouraged to submit abstracts. Although the central focus of this conference is on the Hmong, papers of a comparative nature that focus on the Hmong and other ethnic groups are equally welcome. Presenters will not be required to pay the registration fee for attending, but will be expected to cover their own travel and accommodation costs. Scholars interested in presenting are encouraged to submit individual abstracts not exceeding 250 words, or ideas for panels not exceeding 400 words. Submissions should be sent to Mai Na M. Lee at mainalee@umn.edu. Abstracts should be received no later than April 15, 2013. Acceptance of abstracts and panel ideas will be confirmed by May 30, 2013.